While the leaves are starting to turn brown and the nights are getting darker, the days (here in Cheshire, anyway) are still remaining warm and mostly dry, although to use the word sunny would probably be stretching it a bit (although the sun has popped out from behind the clouds)! And my work this week still has that summer feeling, even if the unseasonably warm days are starting to feel slightly autumnal. As you can see, I've been creating for art licensing again... and that denim is still getting used (and kind of recycled)! But I'm in a quandary about how to move forward (if at all) with my digital stamps and other other downloadables. It's difficult to make a decision, because information about a realistic way forward within the new EU laws (coming into force in January 2015) isn't at all clear. It's all the more frustrating because so many people are completely unaware of the new law - even Etsy tell me they haven't heard of it! I'd be happy to move my business over there if it made it easier, but at the moment it doesn't look like it will. 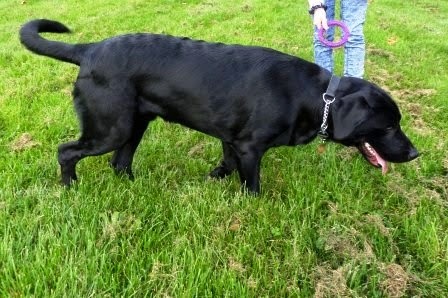 Meanwhile, there's good news in that Guide Dog puppy Quentin is recovering well from his op. He was delighted to have his lampshade-style collar removed - he couldn't stop licking the collar and wagging his tail when it came off! Amazingly, he had completely accepted it, and didn't try to take it off even once - although he did run into a wall, splitting it - then chewed the split to the point where we needed a new one! 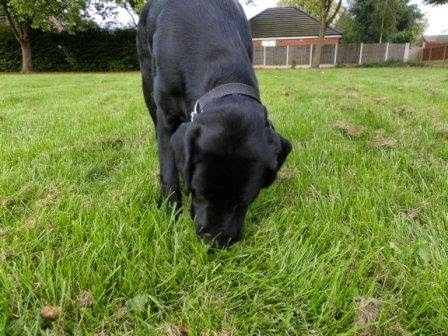 Today he had his first free run for about 10 days - I think that was even better than getting the collar removed! I didn't manage to get any action shots - but I think he looks happy enough in these photos! He couldn't understand why we were by-passing all the good running places while he was recovering! I feel your pain..I decided to get renter's insurance, and 3rd party liability to sell at certain markets, and now am not allowed to sell outside of Canada, because of any legal issues that might 'crop up'...so my Etsy shops must be strictly Canadian and that limits my online selling even more..hardly seems worth it.. I know - it all seems a bit bonkers when governments are trying to encourage small start-ups! I love the Summer artwork, I would happily display it in my house and then smile whenever I passed it! I hope you can find a solution to the new EU regulations, it would be such a shame if it led to small companies such as yours ceasing trading. Still sunny in wiltshire too, i can't believe how lovely and warm it is for so late in the year. Its hard to know what to do re the new law, i'm already selling my downloadable papers on Etsy so my plan is to just wait and see what they decide to do about it when the time comes... i have my fingers crossed there will be a solution. 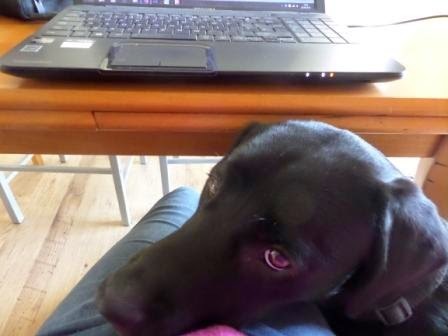 Awh bless Quentin, labradors are such well behaved dogs aren't they? Hopefully common sense will win the day in the end with these regulations (but maybe don't hold your breath) Your work is so lovely. Sunny but chilly in the mornings here in Cov too! Wonder why they are bringing in this legislation now when it is so detrimental to the small business? Hope you can find a way to manage it Wendy. Quentin remains lovely - such cute eyes looking up adorably! I still want one!! Julie: you wouldn't describe him as well-behaved when you see how excited he gets by attention from other people (visitors, vets, etc!). Jenny: I think that may be different legislation. The only loophole in this one that I can see is if there is "substantial human intervention" in the buying process. Nobody seems to know for sure if emails rather than automatic downloads would be enough "human intervention" but it's thought they might be. It does seem a backward step though. Glad that Quentin is able to enjoy a run around again! Good luck with sorting out the digital downloads! Glad to see Quentin is on the mend and rampaging around having fun. 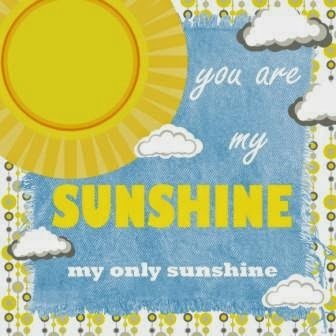 I really love the You are my sunshine image. 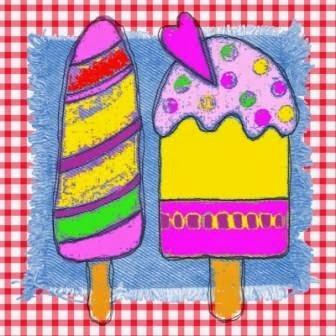 I love the ice lollies - a final blast of summer before we go completely autumnal! Hi, I love your craft, is beauty, I love a colors, I like this , I follow your blog, hugs from Brazil.